That question is at the center of today’s gospel. It has its origin, however, in last week’s gospel and John the Baptist’s call for repentance. Today’s gospel (Luke 3:7-18) is the continuation of last week’s (Luke 3:1-6). You may remember the refrain from last week: Repent. Prepare the way of the Lord. Make his paths straight. Valleys shall be filled. Mountains and hills shall be made low. The crooked shall be made straight. The rough ways shall be made smooth. Last week I placed John’s call for repentance in the context of the San Bernardino shooting and I left us with a couple of questions. What is our responsibility to that shooting? How will we repent of that event? Those questions, however, are not limited to that one event. They apply in every situation in which there is suffering, violence, pain, and brokenness. They are not questions conditioned on guilt but questions about how we live our faith in this world. The question of repentance is always before us. Last week John the Baptist was a voice crying in the wilderness. This week he is a name-calling zealot for repentance, threatening wrath, fire, and axes. “You brood of vipers, you sons of snakes. I don’t want to hear about Abraham. I don’t care who your daddy is. I want you to do something.” He doesn’t want excuses, he wants action. “Bear fruits worthy of repentance,” he says. 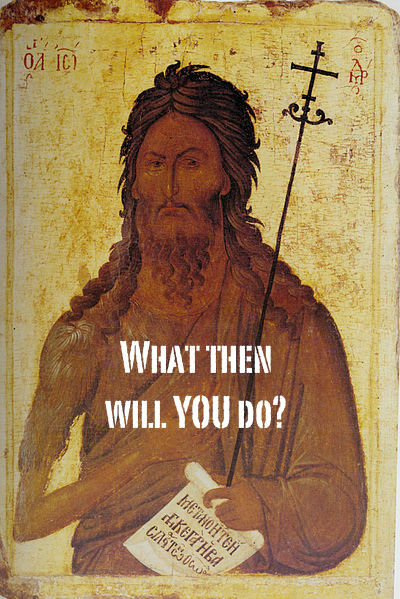 “What then should we do?” That question is asked of St. John three times. The crowds ask it. The tax collectors ask it. The soldiers ask it. It’s a question many of us are asking these days. How many of you have asked that question as you look at the world today? My guess is that most of us have. How many of you have had circumstances in your personal life or relationships that left you asking that question? I suspect we all have. How many of you asked that question after last Sunday’s sermon? I know at least some of you did because you came to me with that question. We know that question all too well. It’s the question we ask when life is complicated and difficult, and the world has gone mad. So let me ask you this. What’s behind that question? What’s it really about? I think it’s more than a request for information. I don’t think people are saying, “Tell me what to do. Give me an answer.” I think that question points to and reveals our sense of powerlessness. When I hear you ask that question, when I hear myself ask that question, I hear us saying that we’ve come up against something bigger than ourselves. We’re scared and overwhelmed. Life is out of control. We feel helpless to fix the situation. On the one hand our words and actions take on a violent tone. We stereotype, blame, and act against all Muslims, all refugees, all poor people, all NRA members, all police officers, all Democrats, all Republicans. When we do that we become just a bit more like the evildoers against whom we are fighting. On the other hand we can become silent and passive. We deny any responsibility and declare it to be somebody else’s fault. When we do that we’re standing dangerously close to the border of indifference, one step away, and the only thing worse than the evil we are fleeing is our indifference to that evil.1 Either way, fight or flight, nothing changes, least of all us. Powerlessness is the middle ground between fight and flight. We are powerless to fight the world’s situations on our terms and we are powerless to get away from them. That’s a source for much of our fear, anxiety, anger, and frustration. That same powerlessness, however, is our way forward. Our powerlessness opens us to a new and different source of empowerment. Instead of limiting possibilities our powerlessness now creates new possibilities with “the one who is more powerful.” Powerlessness does not mean we have no choices, it means we must make different choices. We may be powerless to change the world but we can choose to change ourselves. We may be powerless to escape the world but we can choose to live a different way. Isn’t that what St. John is telling those who come to him? He doesn’t ask them to change the world but to change themselves. He doesn’t tell them to quit their jobs but to live a different life. The crowds who came to him could not eliminate poverty, but they could share what they have with the cold and hungry. The tax collectors who came to him could not overhaul the tax code, but they could be honest. The soldiers who came to him could not end the Roman occupation, but they could act with integrity and not abuse their power. In each of those situations John focuses on people and relationships. His answers are simple, concrete, practical. For those who want the world fixed John’s answers are not very satisfactory. Poverty still remains, unjust economic systems still exist, and power is still abused. But let’s be honest Jesus didn’t really fix the world either. He engaged and gave himself to the world one person, one relationship, and one moment at a time. He loved the world to death and beyond. He showed a different way of being, a different way of living and relating, he offered different priorities and values, and then invited us to participate and follow him. In doing all that he showed us what it means and looks like to be human, to be the dwelling place of God. What then should we do? This probably won’t come as a surprise to some of you but I can’t tell you. I cannot answer that question for you. It’s your question to ask and yours to answer. I can, however, tell you some things I’ve seen and heard. I watched this parish take the lead in creating and sustaining the Uvalde Food Pantry. That was an act of repentance. We didn’t and won’t eliminate hunger in this town but here’s what we did. We engaged the world and we refused to be indifferent. It was a way by which we realigned our lives and values with the life and values of Christ. Every few months we have a Taizé service and invite people to be silent, to be still, to rest in God. That also is act of repentance, a returning to ourselves. That will not overcome the chaos and noise of the world. Instead it reminds us that God is present in that chaos and noise. A woman recently told me that when she sees a Muslim or someone who looks Muslim she is now so much more intentional about looking in the face of that person, smiling, and saying hello. That simple act will not eliminate prejudice or hatred but it is a reclaiming, recognition, and return to a shared and common humanity. Last week a teacher told me that she has begun a mantra with her students, “Let there be peace on earth and let it begin with me.” She first had to help them understand what peace is. She is a voice turning away from violence and teaching others to do so. Those kids won’t end the wars in our world but that teacher has planted seeds for a new conversation in a new generation and if we don’t plant seeds we have no harvest. A few days ago I read that a group of Muslims in San Bernardino have come together to raise money for the victims and families involved in the shooting. So far they have more than $180,000. They will not end radical Islamic ideology but their repentance keeps hope alive. They are being responsible to another’s pain though they themselves did not cause it. Someone told me that he has drastically limited the amount of time he spends watching and reading the news. That is not about ignoring or denying the events of the world and it’s not running away. It’s repentance. He’s turning away from that which has become toxic for him, making space, and opening his heart to hear a different voice. What then should you do? Better yet, let me ask you this. What then will you do? 1. Abraham J. Heschel, The Prophets, vol. 2 (NY: Harper Torchbooks, 1975), 64. When we are overwhelmed and we do not know what to do, when the world has turned upside down, and us with it, when we are left confused and bereft, then there is a simple first step. Make tea. Brits have known this for a long time; we make tea. It is not that the tea actually solves anything, but the simple act of making a decision; a choice for life and for rest, and then following through on it, helps us to find our equilibrium again. We make tea when life is out of control, and by this simple process we find where we fit in an uncertain, out of control world. We fit in the kitchen, making tea, and we give ourselves those few quiet minutes to focus on the kettle, the water, the pot, the tea, the whether milk and/or sugar. And having mastered those few steps, and having given love in the form of tea to everyone we can find around us, we then take a deep breath and do the next thing, whatever it may be. That still small voice is very readily heard when we are standing waiting for a kettle to boil. Had there been tea in first century Judea I am pretty sure John the Baptist would have recommended it.